I don’t want to go into too many details here, but it provides detailed accounts of the environmental changes occurring across the J/K transition, and how this impacted upon different plant and animal groups throughout this period. The main conclusions I think are worth highlighting here, so you don’t have to read the whole thing! 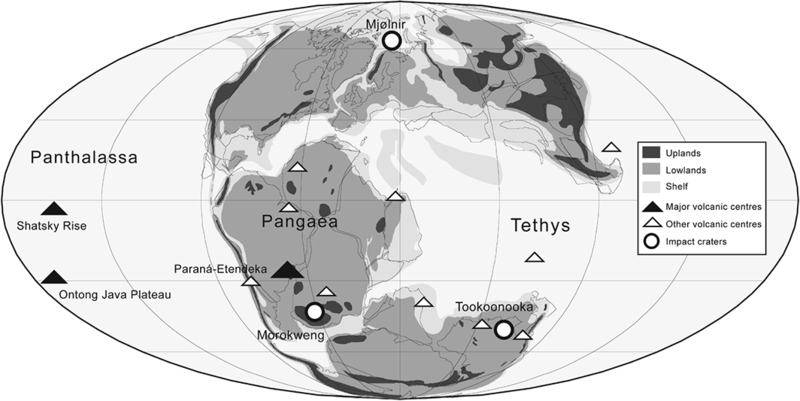 The Late Jurassic–Early Cretaceous interval represents a time of major biotic upheaval and reorganisation. The precise magnitude of extinction is currently unknown, especially in light of our increasing awareness of the impact of incomplete sampling on the patterns preserved in the fossil record. However, it is clear that the J/K extinction, although severe in multiple groups, was not on the same scale as that for the ‘Big Five’ mass extinctions. What is becoming apparent, though, is that the J/K interval represents a period of elevated extinction, substantially protracted over some 25 million years, and involves the persistent loss of diverse lineages, and the origins of many major groups that survived until the present day (e.g. birds). 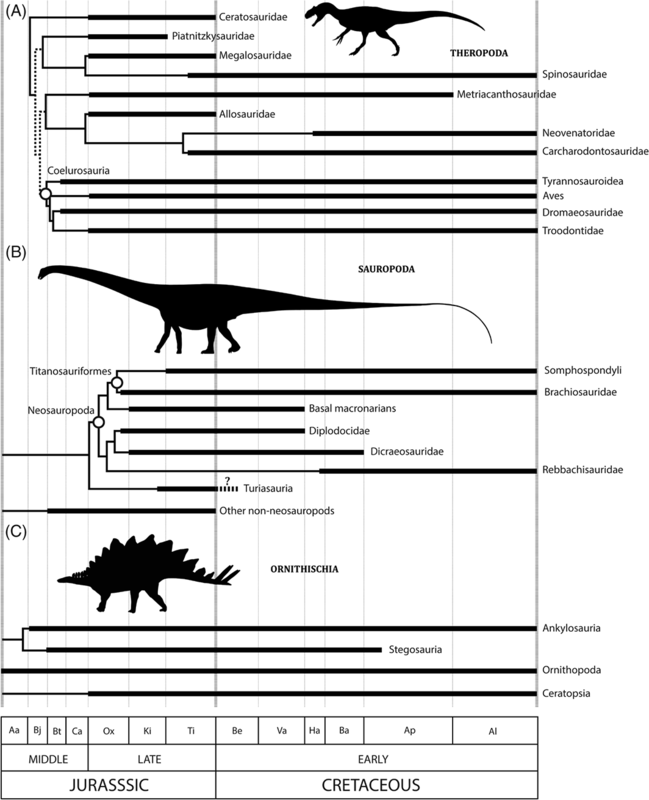 The Late Jurassic–Early Cretaceous was a period of major environmental perturbations that have largely been ignored or overlooked in historical analyses of Mesozoic diversity dynamics, in favour of more ‘exotic’ extinction intervals. A range of evidence indicates the following major changes: (i) at least three large bolide impacts in the latest Jurassic, one of which might have been bigger than the end-Cretaceous Chicxulub impact (Fig. 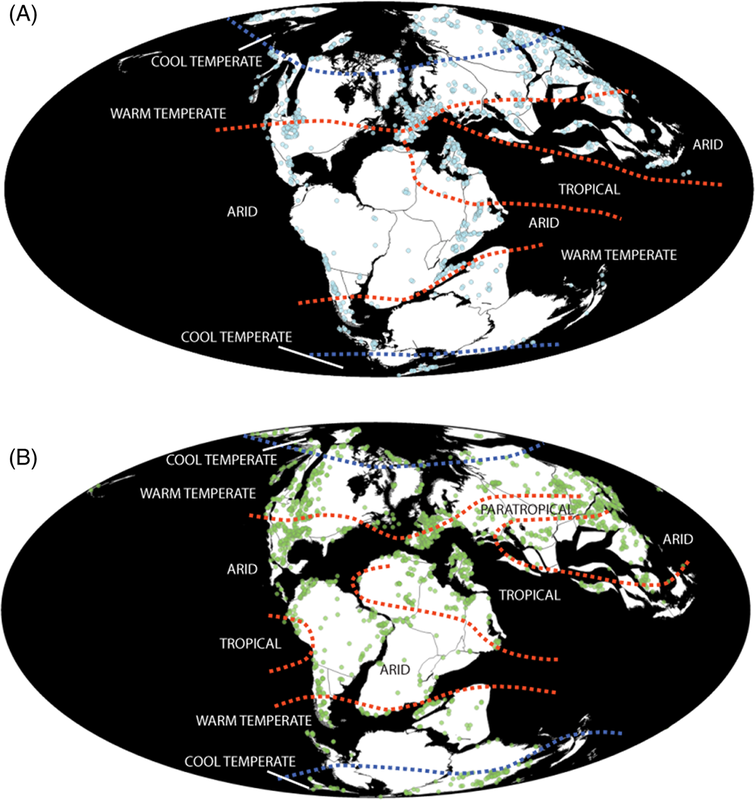 3); (ii) a Late Jurassic–Cretaceous ‘greenhouse’ world, interrupted by a latest Jurassic ‘cold snap’ and corresponding aridity episode; (iii) a global drop in sea level to a eustatic lowstand through the J/K boundary (Fig. 2); (iv) potentially heightened levels of anoxia, oceanic stagnation, and sulphur toxicity over the J/K boundary; (v) a series of repeated ‘biocalcification crises’ in the Early Cretaceous, along with two purported oceanic anoxic events in the Valanginian and Hauterivian; (vi) the emplacement of the Paraná and Etendeka (late Valanginian–Hauterivian) and Ontong Java Plateau (Barremian–early Aptian) flood basalts, the latter of which might have been three times as voluminous as the end-Cretaceous Deccan volcanism; and (vii) some of the largest volcanic episodes in the history of the Earth, following the emplacement of the Shatsky Rise supervolcano at the J/K boundary. This series of environmental perturbations warrants further investigation in the context of potential biotic effects throughout this time. The J/K boundary represents an opportunity to investigate the environmental and ecological factors governing recovery (e.g. Wei et al., 2015). Distinct extinction and diversification patterns are clearly recorded in different groups, with a range of potential extrinsic abiotic controls. Additionally, the fact that a faunal turnover at the J/K boundary appears to be coupled with an ecological turnover in many groups, suggests that intrinsic biological parameters, principally regarding acquisition of key ecological characteristics and morphological plasticity and disparity, require further investigation in terms of the effects that these might have had on survivability. For example, low disparity in sauropterygians and turtles is coupled with strong evidence for a faunal turnover, whereas high ecological diversity in ichthyopterygians, lepidosaurs, and mammaliaforms is reflected in high survivability rates across the J/K boundary. This level of complexity necessitates the use of a multivariate approach to assessing macroevolutionary drivers (e.g. Benson & Mannion, 2012). There are major gaps in our current knowledge of biological and Earth systems processes and patterns during the J/K interval. These include the absence of sampling-standardised diversity trajectories for many terrestrial and marine clades (e.g. plants, terrestrial insects, and small-bodied tetrapods), and the biotic and abiotic drivers of these patterns. Substantial progress has recently been made in modelling the possible drivers of diversification and extinction, especially in terrestrial tetrapods (Sookias, Benson & Butler, 2012a;Sookias, Butler & Benson, 2012b; Benson & Druckenmiller, 2014; Benson et al., 2014a,b) and marine invertebrates (e.g. Peters,2008). Combining these methods with increasingly sophisticated ways of analysing diversity in the fossil record (e.g. Alroy, 2010a,2014), will provide considerable insight into the macroevolutionary history of life through the J/K boundary. So, there you have the short (ha) summary of the paper! I’ve got a couple of things in the works now which help to resolve some of these questions, and will be sure to post them on here as soon as they’re out! Horsedrosaurus, the dinosaur that wanted to be an equid.